For any woman who is searching for comfort, extreme style and elegance in a women's boot, it would be hard to top any of the Frye Melissa Boot styles. Best Seller: As of this writing, the best selling Frye Melissa Boot is the "Melissa Button" - shown left in photo in "Fawn". Extremely good reviews on this boot! Gorgeous supple leather, tall traditional pull on style. Love the shape! Melissa Honeycomb - this is also a gorgeous boot, but has a bit of an edge to it with a studded harness that adds so much to the looks! This boot truly stands out on it's own as a unique style in the Frye Melissa boots collection. 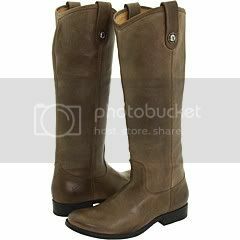 Melissa Tall Riding Boot - Although a few of the boots in the Melissa collection have a "riding inspired" style to them (including both of the boots listed above), this boot is specifically intended (and named) as a riding boot for women. If you love the look of a riding style boot, this one is definitely worth checking out. It has a unique look with lacing up part of the front of the boot for a vintage look like no other riding boot I've seen! Melissa Short Boot - The height of this boot is what really sets it off - it shows off the cut and shapeliness (and feminine looks) more than any of the other styles. It also features a delicate harness about the ankle area which makes this boot a unique style in itself. I am consistently impressed with the various and unique looks that Frye continues to "roll out"! The Frye Melissa Boot collection is definitely not an exception to this! And - more styles may be following. If and when they do, you will see this page updated to reflect the changes.